Think back, way back to the days when you loved math class and you thought gym class was just…super boring, when you would rather be in the student council than be on prom court, and when you longed for pop quizzes or any test for that matter. Wait, you say none of those apply? Well honestly we didn’t think they would either but we have a quiz for you, and not just any quiz, this quiz is solely about custom made suits here at iTailor. Trust us when we say we didn’t create this to stump any one, more so as a guide and to provide a few helpful hints as you decide which custom made suits you will design and how. So without any more reminiscing on how much you miss school days, let’s get into our quiz on custom made suits. 1) iTailor’s custom made suits are the lowest priced custom suits online, and around the globe? 2) iTailor offers single and double breasted custom made suits that incorporate functional buttons, 9 different design options for pants pockets, and jackets with the choice of one to six buttons. 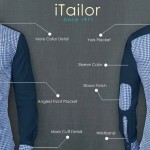 3) iTailor currently has nearly 300 fabric options to design your custom made suits from. 4) iTailor has a new premium wool blend fabric option for its custom made suits. The price on this premium fabric is..? 5) How many fabric options are available in the “new collection” premium wool blend for our custom made suits? 6) iTailor has been in the tailoring business and constructing custom made suits since..? 7) When it comes to custom made suits there are many facets of the suiting that can be talked about; from monogramming and elbow patches to lapel size and style to the angle or style of your jacket and pants pockets. We would like to know what your favorite part of our custom made suits might be? Is it a specific design option? The price? The experience behind our craftsmanship? Maybe something very specific to you..
That’s it for this week, be sure to come back next week and get the answers to our quiz and see how well you did. Don’t forget If you liked what you read or have any questions please feel free to let us know and comment below! If you’d like to design your own custom made suit from nearly 300 fabric options click here and start designing your men’s suits today! Don’t forget to subscribe to our newsletter below for free company updates and our weekly sales on custom made suits, shirts, luxury designer shoes, and more!